Water leaks can cause a lot of damage to a property, especially when you know there is a leak but don’t know where it is located. Has your water bill drastically increased? Have you noticed water pooling in your home or out in the yard? Do you hear water flowing even when you have turned off all of the taps? If you have noticed any of these things in your home, Flow Plumbing can help! Flow Plumbing is the top choice for leak detection services in Rockwall, TX and the surrounding areas. At Flow Plumbing, we have earned the reputation of being the best option for expert leak detection in Rockwall, TX. As a matter of fact, our highly trained professionals often assist other plumbing companies with leak detection as well as our own customers! Over the past 15 years, Flow Plumbing has worked hard to become leak detection experts. 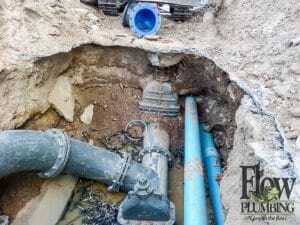 We have honed the craft of locating water and sewer line leaks fast and with great precision. If you have a strong suspicion that there is a leak on your property but you have no idea where it is, the best thing you can do is to contact a licensed plumber to perform a leak test. Don’t let a hidden water leak continue to damage your property—call Flow Plumbing today at 214-388-8838! At Flow Plumbing, we take pride in providing fast, affordable, and incredibly accurate leak detection services! It only takes our licensed plumbers 60-90 minutes to determine if you have a leak in your water or sewer line, and in most cases we can pinpoint the leak to within 3 feet of where it is located. Need Fast & Affordable Leak Detection in Rockwall? Drastic increase in your water bill. Hearing water running even when the taps are closed. Water meter continues to run even when water main is turned off. Sagging or damaged ceilings, walls, or floors. Pooling water on floors or carpets. When you notice any of the signs of an undetected leak, it is extremely important to call a licensed and experienced plumber to perform a leak detection or hydrostatic pressure test to determine if you do indeed have a leak. We invite you to contact Flow Plumbing is you suspect a leak on your property—we can quickly figure out if you have a leak, detect where it is located with pinpoint accuracy, and then offer affordable options for repairs. Give us a call at 214-388-8838 and learn why we are the preferred choice for leak detection in Rockwall, TX. Slab leaks, which are leaks that are located under the slab foundation, are unfortunately very common. At Flow Plumbing, we have years of experience and expertise detecting and repairing slab leaks. We offer prompt and affordable slab leak detection in Rockwall, TX, and will quickly locate a leak with amazing precision. Detecting a slab leak requires highly skilled plumbers as well as advanced equipment; Flow plumbing is proud to be the go to source for slab leak detection in Rockwall, TX! We want to help you—call us today at 214-388-8838 to schedule slab leak detection in Rockwall, TX. Once a slab leak is detected, it needs to be repaired as fast as possible to limit damage. At Flow Plumbing, we offer both slab leak detection and repair services for affordable prices. You can count on us to quickly locate a slab leak and then provide expert repair services that are fully guaranteed. Don’t waste your time hiring one plumbing company for leak detection and another one for repairs—we can take care of all of your slab leak detection and repair needs! When you want the best slab leak detection and repair services in Rockwall, TX, choose Flow Plumbing!